As we mark the centenary since the cessation of conflict and the silencing of the guns on 11th November 1918 to mark the end of World War I, we remember both the fallen and those who came home again, grateful not be listed with the 16 million of those who died during four years of war on the battlefields around the globe. The scale of the injuries seen were unprecedented and military surgeons had to quickly learn to develop new treatment techniques, both on the front line and once soldiers were shipped home to hospital. In the final years of the war, so swift was the learning that it is said that this resulted in more survivors to injuries which would have been fatal earlier on in the conflict. In fact many wounded soldiers were successfully treated and returned to the trenches to fight again! The majority of injuries came from shell blasts, shrapnel and gun shot wounds. 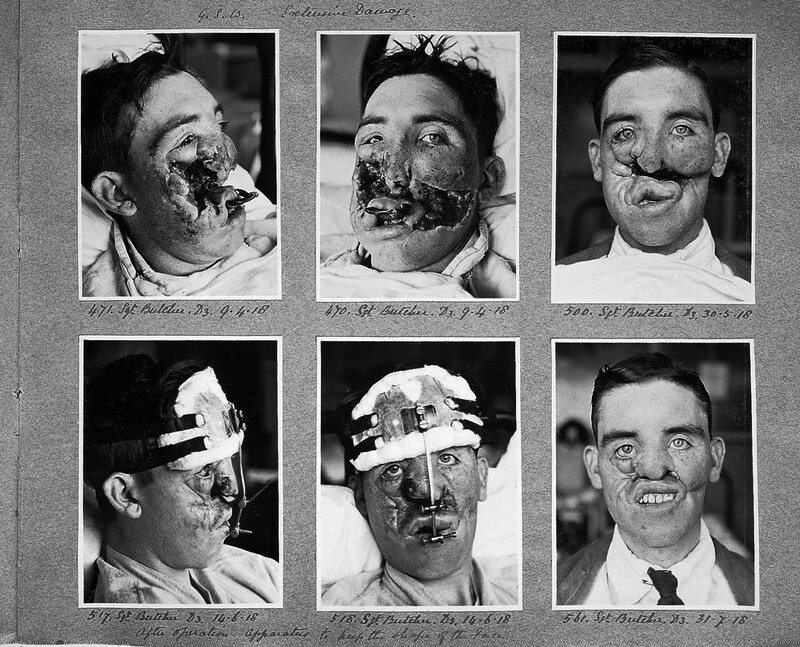 Those injured in the face often had wounds regarded as severe, but surgery of the time was limited and most survivors were left with major facial deformities which rendered it difficult for them to breathe, speak, eat or drink, and of course they were left looking horrific, which made integration back into society and family life very difficult. Harold Gillies, a native of New Zealand, was a young ENT (ear, nose and throat) surgeon at the time. Sent to the battlefields himself, and on seeing the attempts made to address severe facial injuries on the Western Front he realised that there was a need for more specialised care. The authorities agreed with him and he was given the go ahead in 1916 to set up Great Britain`s first dedicated plastic surgery unit in Aldershot at the Cambridge Military Hospital. Front line hospitals were checked for suitable patients to be helped at the unit and the pioneering work or `strange new art` as Gillies referred to it began. Much of it was trial and error and some referenced techniques pioneered in Ancient India by Sushruta. The tube pedicle skin graft, in which a flap of skin is separated, but not detached, and used to suture over an injured area, only being detached once blood supply is established, is probably Gillies` best known development. 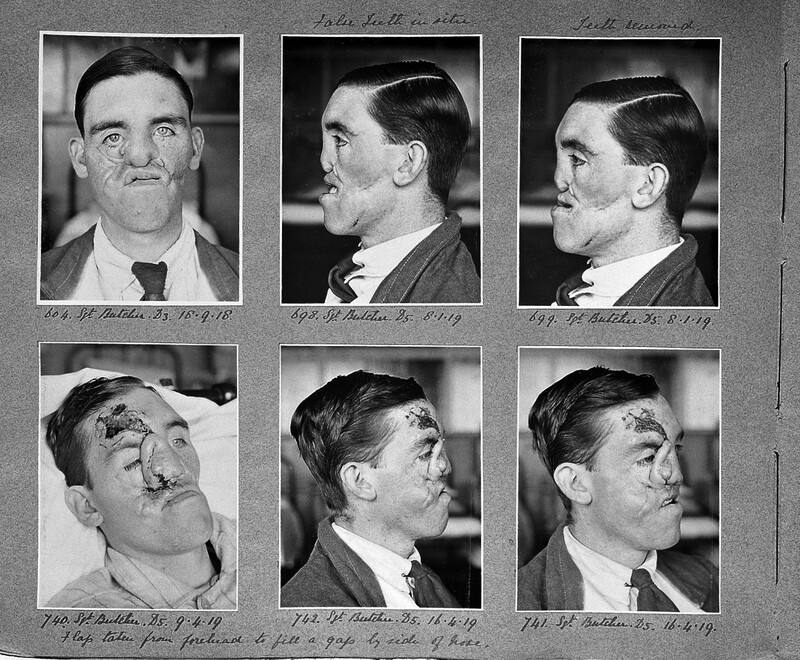 In 1920 Gillies produced his magnum opus, "Plastic Surgery of the Face" based on his wartime experience. It is also worth pointing out that as many of the men required multiple operations, it was during this time that advancements in anaesthesia techniques, using rubber tubing, also came about; many of which are still used today. Plastic Surgeon Taimur Shoaib also reflects on surgery through the ages, "I have a special interest in rhinoplasty and I find the history of plastic surgery hugely relevant to this. Plastic surgery started with rhinoplasty back in 600BC in India with what we now know as the forehead flap, described by Sushruta, for reconstruction of injuries to the nose, usually because of a punishment. Criminals, back in those days, would have their nose chopped off (hence the origins of the phrase: "chop off your nose to spite your face") and Sushruta offered a form of reconstruction. The technique was meticulously described in the medical tome that he authored. Rhinoplasty re-emerged as the subject of plastic surgery history in Rennaisance times. A surgeon called Gaspare Tagliacozzi described a way of reconstructing the nose with almost Heath Robinson complexity, using tissue from the inner aspect of the arm, which was still attached to the arm for a few weeks, and the arm was held in place using a perplexingly complicated plaster of Paris arrangement. The modern father of plastic surgery is, of course, Harold Gillies and, interestingly, he also was involved in nasal reconstruction with the war injured from World War I." The National Army Museum reflects on the achievements of Gillies and notes, "Today, Gillies is often referred to as the `father of plastic surgery`. Many of the techniques he developed during the First World War are still used in modern reconstructive surgeries. The concept of cosmetic surgery also emerged as a result of Gillies` work. His desire to restore normal appearance, as well as functionality, was revolutionary. The surgery Gillies` patients received was born of necessity. Their situation was a far cry from the purely cosmetic face lifts and nose jobs we see today!" We are often reminded that Lest We Forget, and this story of the brave men and women who fought to give us our todays and the birth of plastic surgery techniques has special and personal meaning for me, which I have only recently discovered. You see, up until this month we, as a family, had only dabbled in a bit of genealogy. Most of that revolved around researching familial ties to build a hierarchical family tree. But when my son, a Cub Scout, was asked to find out about WWI stories in his family in preparation for the Remembrance Sunday Parade that we all attended yesterday, we delved a little deeper. And I am so glad that we did. You see, it turns out that my husband has a great uncle who fought in the fields of France. Having been wounded once and received the prestigious Military Medal, Sergeant George Butcher went back to the front line only to suffer a gunshot wound to the face in March 1918, aged just 24. We have now discovered that this led to him being under the care of Harold Gillies. Thanks to the archives, now held at the Wellcome Trust and the Royal College of Surgeons (RCS), we can see the photographs which highlight the pioneering work performed on the man who my husband met as a young child, and remembered only as the great uncle whose face scared him. Consulting Room adviser, former President of BAAPS, plastic surgeon Rajiv Grover, said,"WW1 was the greatest human sacrifice in history and the unique injuries suffered by the soldiers stimulated the development of surgical techniques which gave birth to Plastic Surgery. Sgt George Butcher and the brave soldiers who fought not only saved the freedom of the western world but also acted literally as the guinea pigs for the development of Plastic Surgery which continues to help restore lives a century later." Consultant plastic surgeon and immediate past-president of BAAPS, Simon Withey also reflects, "It is humbling and at the same time fascinating to review the images of soldiers such as Sergeant Butcher. The soldiers in the First World War presented with a new and specific spectrum of injuries as a result of several changes to warfare including munitions that were designed to fragment and the relative exposure of the head while living in the trenches. The surgeons looking after those who survived the initial trauma were faced with large numbers of previously unseen injuries. They developed a set of principles of reconstruction that proved both revolutionary and highly successful, and many of these principles continue to form the basis of the Plastic and Reconstructive Surgery, a surgical speciality that emerged from these terrible times." This discovery has meaning both for us as a family, but also serves as a reminder to us all that we should not forget, both the fallen in the great war, but also those whose bravery helped the medical community learn and prosper to achieve the surgical techniques which we perhaps take somewhat for granted today, in an age of cosmetic enhancement over plastic reconstruction. I would ask you to take a moment to reflect on this with me as practitioners who regularly treat modern-day patients with facial aesthetic concerns, and think of those who came before you. 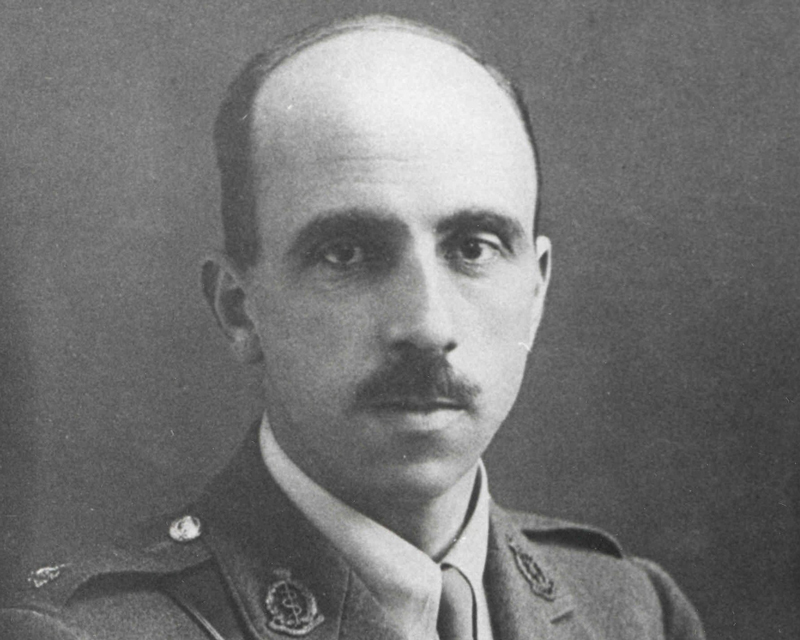 To learn more about the pioneering work of Harold Gillies, you can catch up with the documentary recently shown on Channel 5 entitled Portillo`s Hidden Histories of Britain: Cambridge Military Hospital which is available on catch up TV. To leave a comment you need to be logged in as a Cosmetic Community Member or a Clinic. Please Click Here to login / register with the Cosmetic Community. If you are a Clinic Click Here to login to the partners area of Consulting Room. Lorna has been the Editor of The Consulting Room (www.consultingroom.com), the UK's largest aesthetic information website, since 2003. She is an industry commentator on a number of different areas related to the aesthetic and cosmetic surgery industry; collating and evaluating clinical data, news and statistics and writing a magazine, blogs and feature articles for The Consulting Room and various consumer and trade publications, including Aesthetic Medicine, Cosmetic News and Aesthetic Dentistry Today. Lorna regularly attends key conferences and educational events for the industry and has close contact with many of the suppliers who manufacture and distribute products and devices utilised in aesthetic medicine. Lorna also liaises with press and members of the media researching cosmetic surgery, with the aim of educating and raising awareness amongst the public.